The Royal Netherlands Air Force is to participate in the AIR 2015 event in Amsterdam – the first aerial 3D entertainment show with drones. 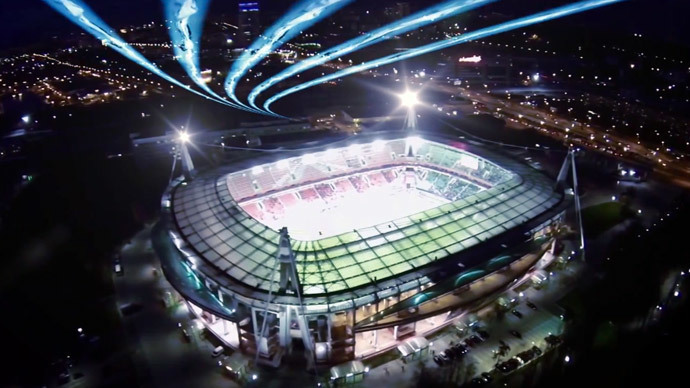 The world’s first drone circus is to be premiered in the Netherlands this year, with hundreds of drones, lasers and projectors involved in a show that promises to dazzle the visitors of the Amsterdam Arena with amazing and magical aerial stunts. “In this high energy and explosive show, drones will take center stage to bring a collaboration and fusion of music, video, projections and special effects. AIR allows you to experience a variety of ballet and battles, races and lasers, circus, illusions and most of all magic from hundreds of drones,” the website said, announcing the show. The date is not scheduled yet, but it could be this fall, and the tickets will go on sale soon, according to the website. Last Sunday, the US Federal Aviation Administration (FAA) revealed preliminary guidelines on the use of small commercial drones, and among the restrictions the necessity to use a drone only within line-of-sight of a person operating it. In the UK, commercially available drones also have some flight restrictions, for instance, central London was declared a no-drone zone this January. However, the “actors” of the AIR 2015 will be flown inside the arena, and they are unlikely to fit in the characteristics of ordinary commercial drones, as they will probably be operated by the Royal Dutch Air Force. The idea to use drones for entertainment shows, however, is not that new. In 2013, Disney introduced a set of patents in order to replace traditional for its theme parks giant puppets and fireworks with drone aerial light displays.